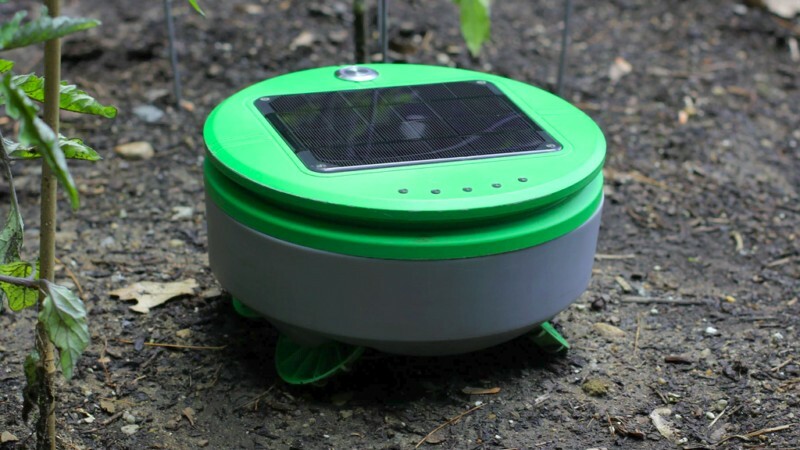 Boston, Massachusetts – Led by the inventor of the Roomba, the Boston-based Franklin Robotics is currently raising funds for their latest release – a solar-powered, robotic weed-killer for home gardens. Named Tertill, the 2.5-pound, disk-shaped robot patrols the garden and intelligently identifies – and whacks – unwanted plants. Word is spreading quickly across the gardening and robotics worlds, and in the first five days of Tertill’s Kickstarter campaign it reached its goal. Now with just over two weeks of crowdfunding left, Franklin Robotics has already raised over 170% of their goal. MarthaStewart.com wrote that the “cute robot… works magic on your unwanted greens.” and Engadget adds that the “Roomba creator wants to do for gardens what he did for your floors.” After dozens of Kickstarter backers from Japan, Australia, Switzerland, Germany, and more have pushed for international delivery of Tertill prototypes, Franklin Robotics has decided to open up shipping to the entire world. Tertill uses unique design elements and a variety of sensors to patrol the garden daily, avoid plants and obstacles, and look for weeds to eliminate. The robot has a simple method of telling weeds from desirable plants: weeds are short, plants are tall. A plant tall enough to touch the front of Tertill’s shell activates a sensor that makes the robot turn away. A plant short enough to pass under the shell activates a different sensor and turns on the weed cutter. Franklin Robotics provides protective collars to put around short plants and seedlings until they are tall enough for Tertill to recognize. Tertill uses a spinning string trimmer to cut the weed off near the ground. Because Tertill lives in your garden and goes looking for weeds every day, weeds are always small when the robot finds them. If the weed sprouts again, Tertill will be there to quickly whack it, and since the weed will never grow enough to have leaves, it will run out of energy and die. Tertill is 100% solar powered, and knows the best times to patrol the garden to use its energy most efficiently. Herbicide-free garden: Tertill helps you maintain a pesticide- and chemical-free organic garden. Diligence: While humans might procrastinate or forget to weed, go away on vacation, or get distracted, Tertill doesn’t. Productivity: Tertill prevents weeds from eating up your crops’ water, fertilizer, and sunlight. Gardening limitations: Tertill is great for gardeners who have limited or challenged mobility, and allows them to spend more time having fun in their garden. Tertill is $249 on Kickstarter right now, and is expected to ship in early 2018. Future Tertill models will include other functions, such as pest repellents, a scarecrow function, and soil quality sensors. Founded in 2015, Franklin Robotics, Inc. is located north of Boston, Massachusetts. Franklin’s imperative is to exploit rapidly developing, low cost robotic technology to accomplish tasks not previously automated. The principals of Franklin Robotics bring decades of experience to this challenge. A focus of the company is the creation of technology appropriate to home gardens, agriculture, and other outdoor applications. Dieser Eintrag wurde veröffentlicht in Crowdfunding, English, General und verschlagwortet mit gardening robot, plants, Tertill, weed von Sebastian Trella. Permanenter Link zum Eintrag.